Giardia parasites - responsible for one of the world's most common gastric diseases - are able to mimic human cell functions to break apart cells in the gut and feed off them, new research has shown. The research team, based in the National Institute for Health Research Health Protection Research Unit in Gastrointestinal Infections, at UEA's Norwich Medical School, wanted to find out more about how the parasite's activities can cause severe symptoms in some patients. Working with colleagues at the Institute of Infection and Global Health at the University of Liverpool, the team looked at cell cultures infected with giardia in the laboratory to see what the parasite was producing that could be interacting with cells in the gut. 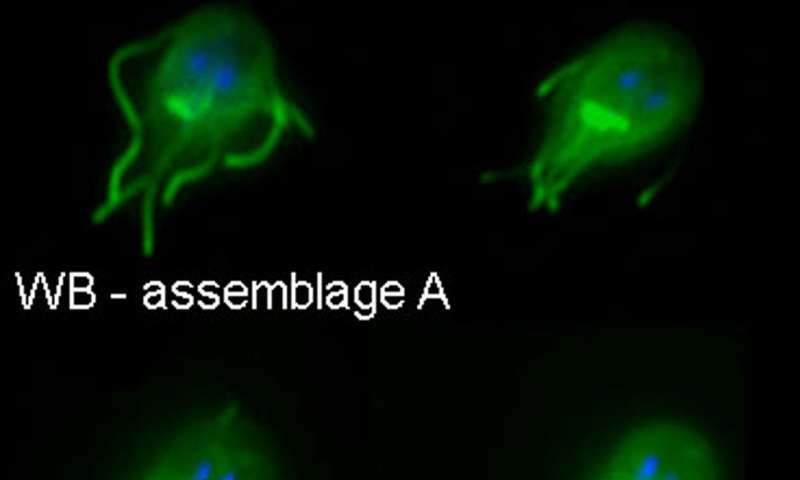 Of the two 'families' of protein identified, the team discovered that one "mimics" a group of human proteins called Tenascins. Tenascin proteins are essential for us - they regulate cell adhesion during wound healing and tissue remodelling - providing help to cells to break apart when necessary and balancing the proteins that glue the cells together. The giardia parasite has evolved by making proteins that are very similar to ours and able to trigger this process. However, the giardia tenascins are used instead to upset the body's balance by preventing healing of the junctions between cells that hold them together. Senior author Dr Kevin Tyler, from UEA's Norwich Medical School, said: "We've discovered an entirely new model for how this disease develops in the gut - which can also explain why in some people the symptoms can be more severe. Because the giardia have broken down the cell barriers and made all these nutrients available, other, opportunistic bacteria can move in to take advantage of these 'ready meals' which can make giardiasis even more severe for some. "Giardia was one of the very first disease-causing microbes to be visualised - scientists have known of its existence since 1681. But this is the first time we have been able properly to understand why this parasite is so successful."